Spacious, lucid Apartment in Cadiz the pearl of the Atlantic Ocean. 300 m to the beach. Best for beach holidays combined with the atmosphere of a wonderful city. Sun all over the year, Mediterranean citylife, relaxing and original culture. 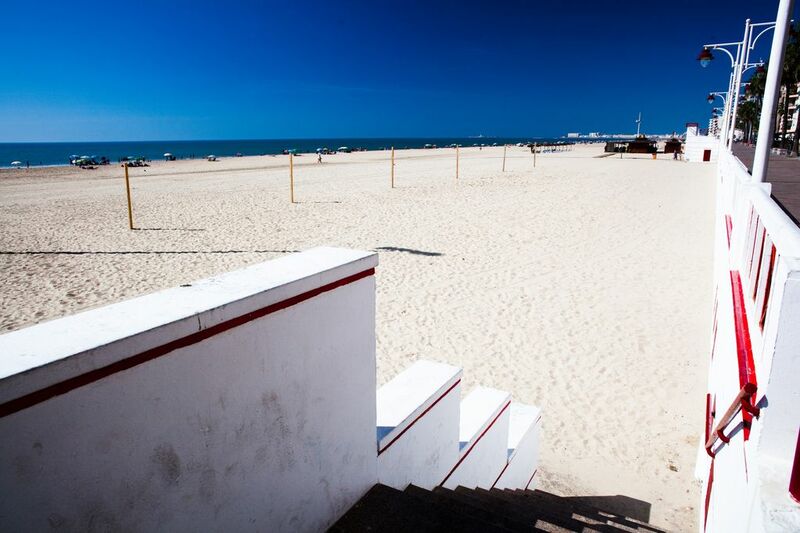 Cadiz is unique and has a mild climate throughout the year with sand beaches as far you can see. A lot of more unbelievable beaches are easy to reach by car or bus. Cadiz is the best start for any kind of activities at Costa de la Luz. Get the experience of the sparkling atmosphere of this incomparable city! Dicover the tapa-bars in the old town! Visit the city of Jerez where Sherry wine has its origin, or take a trip to the magic City of Sevilla, to surfers paradise Tarifa, or a short trip to mystic Marocco, or take a ferry to Canary Island, and more. Our winter offer is starting at 750,00 Euro per month. We are a spanish/german family and living since many generations at Costa de la Luz. So we know very well the area and can help you in many ways with tipps about the local circumstances, so your stay in Cadiz should be a wonderfull and individual experience. We decided to settle down in Cadiz because the Costa de la Luz touristic developement is decent. Cadiz is the ideal homebase for exploring the coasts, even in winter. When life in touristic facilities comes to an end, you will find many cultural offers and diversion in Cadiz. Big sandbeach, very suitable even for kids and babies. Many restaurants with local cuisine. The fish is just fabulous. The local people of Cadiz have the reputation to be the most friendly and relaxed people in the country. All supplies are very close. The infrastructure is very good by train and bus in all parts of the country. The apartment is also used by the owner, when it’s not rented. Therefore it has upper furnishing. In the main bedroom you’ll find a huge cabinet an a big commode, which are sufficient for any luggage. You’ll have a big French bed with a superb innerspring mattress. In the second bedroom you’ll find also a spacy cupboard, commodes and two single beds which can be combined into a double bed, of cause with best innerspring mattresses too. The living room has a comfortable couch which can be fold up to another bed, a rocking chair and of cause SAT TV and many books and information about Spain. In the dining area you’ll find a nice sideboard and a huge and heavy old oak desk with six chairs. The kitchen is simply fitted with all you need, except a dishwasher. The bathroom is fitted with a bidet a bathtub and shower and cupboards. All room have access to a hallway with a cabinet and wardrobe. The apartment is simply furnished in a lovely and comfortable manner. I stayed 1 month at this apartment. As it is also used by the owners, it has all the little convenient touches for living (shopping cart, laundry basket, pegs etc). Very clean. Owner was very quick to respond when we couldn't turn on hot water (our bad)… Location very close to bus and train line, and 3 blocks from beach. Wifi was good, there was TV too but I didn't use it. Kitchen well equipped. Only possible negatives could be that there isn't much of a view from the windows (if that is important) and it's a bit of a bun fight for parking (if that's important). Otherwise fantastic and I would definitely stay again. Thank you very much! We´re happy you enjoyed your stay in our apartment and hope to see you again in Cádiz. Immaculate, clean smelling well equipped apartment. Lots of space for living & plenty of room to store things away. Well equipped kitchen made cooking easy. Lots of natural light. In the evening it was cost because it’s equipped as someone’s home so there are lamps, side tables & soft furnishings. Beds were comfortable with planets of extra bedding if needed. Large fridge & freezer & decent washing machine too. Living here was easy. An easy bus ride into town or a 45 minute walk along the sea path. Thanks. We´re glad you´ve had a nice stay in our apartment in Cadiz. Hope to see you again. We were very pleased with the proximity to the beach and lively shopping area with restaurants and cafes. The number 5 bus was two blocks away and we were able to easily navigate throughout the city. The apartment was charming, clean and fully equipped. Thanks so much. Hope to see you again one sunny day in Cadiz. We spent a fantastic week here in July 2017. The apartment is as described - well equipped and very comfortable. The beach is superb and only 5 minutes away. There's a good supermarket across the road and there's plenty of decent bars/restaurants within easy walking distance. The buses to the old town are also frequent and cheap. We appreciate that our guests had a good time in our apartment and we hope to welcome them again in Cadiz. Die Wohnung und die Lage.....ein Träumchen!!! Wir hatten das große Glück im März 2019, dass von Sonntag zu Sonntag uns die Sonne verwöhnte... im wahrsten Sinne des Wortes!! Die Wohnung ist einfach nur schön und sehr gemütlich. Es fehlt an nichts, was man sich in einer Ferienwohnung wünscht. Die Lage ist optimal. Bus gerade um die Ecke, Supermarkt ein paar Minuten vom Haus und sehr gut sortiert. Und dann der Strand..... Einfach nur wunderbar!!!! Die Strand-Restaurants sind ebenfalls sehr empfehlenswert! Kurz gefasst: hinfliegen und genießen!!! Und das werden wir sobald als möglich!! Es freut uns sehr, dass Ihnen Ihr Aufenthalt bei uns so gut gefallen hat. Wir würden uns freuen Sie bald wieder als unsere Gäste begrüßen zu können. Nos alegramos que os gustó el apartamento y esperamos que volviereis. Cadiz has been built in the ocean. Therefore its micro climate is unique. Most time of the year the sky has a deep blue colour and even in winter the sun is strong enough for walking in shirts on ample perfect sand beaches. In Cadiz and surroundings you can Spain, pure and authentic. It is definitely incomparable to Costa Blanca. A Cuban guy said to me: He looked for the city in Europe, which is most similar to Havanna, so finally he found Cadiz. Although at the most south-western part of Spain Cadiz is a central wheel for regional traffic. From here you can reach every corner of the region by common transports easily. This is most interesting for guests who don’t like to rent a car, so this means a good saving. Golf: There a some 18 hole golf courses in the region. Please consider that this region is climatically an arid zone. In order that it is not going to be wasted, there is sufficient water in the dams in the inner country. By the construction of golf courses the water budget of the region is deeply stressed, because this huge grass fields are consuming a lot of water. Also more and more construction companies are hoping to make quick money by building golf resorts, becoming ghost towns in wintertime, and bringing the landscape to its ruin. Therefore we like to ask you, not to use golf courses where nature originally did not have had the plan to create huge grass lands. Thank you! SONDERANGEBOTE Wir bieten Spezialpreise für Langzeitmieter (ab 1 Monat) für die Monate November-Februar ab 800 Euro pro Monat an! In unseren Wochenpeisen sind generell alle Nebenkosten und die Endreinigung enthalten! MINDESTAUFENTHALT Unser Mindestaufenthalt beträgt sieben Nächste. Es ist möglich für kürzere Zeiträume zu buchen, es wird dann aber der volle Wochenpreis erhoben.